Parents always ask me, "Coach Yancy, how can I make sure that my kid can score the ball?" These parents just want to make sure their player can be competitive, even if they are playing against more skilled opponents. It happens all the time - sometimes you're up against players who are taller, stronger, or more athletic. Maybe they have more training. But, you still have to compete. You need to do everything you can to help your team win. A player who knows how to get themselves open, or to get their teammates open, is incredibly valuable. Even if your opponent is more talented than you, if you know how to get open you can still get yourself a good shot in all of these situations. Plus, for players who aren't as skilled as their teammates, understanding how to get open can make them more valuable to the team. You'll find that you'll score more and get more playing time. For players who are very talented, these skills can make them stars. So, how do you get open? By utilizing picks and screens and moving without the ball. Even taller or more athletic defenders won't be able to stay with you if you're good at these skills. Let's start off with a "by-the-book" definition first. Both a screen and a pick are very similar. They are both blocking moves by a player which frees up another player to shoot or pass. The difference is, it's called a pick if it is set on a defender guarding the ball, and it's a screen if it's on a defender who is not guarding the ball. To set a pick or a screen, the player approaches the defender, bends their knees while keeping their back straight, and stands wide. To protect themselves, the player setting the screen should keep their hands down in front (typically for boys), or across their chest (typically for girls). It's important for the player setting the pick or the screen to not run into the defender - that is a violation of the rules. It's also important to stand still once you set it. You cannot move once you've set the screen, or you will be called for an illegal screen or pick. Allow the defender to run into you - if you have positioned yourself well, it's up to your teammate to get themselves open. A virtual player setting a pick. This video game player has good form! Now that we know how to set a pick or a screen, let's talk about using one to get open. Picks allow the player with the ball to get open. The player who is setting the pick can also attempt to get open by cutting towards the basket - this is the classic pick and roll. They can also find open space on the floor for a jump shot. This is often called the "pick and pop" or "fading off of the pick." If you have the ball and a teammate sets a pick on your defender, move toward the pick in a way that makes your defender run into the pick. The most effective way to do this is to try to brush shoulders with your teammate. The goal is to create space between you and the defensive player. This allows you to drive to the basket, or to take a jump shot if you are open. Of course, you need to be able to make the open jump shot. You can check this out in action in the video below, where Larry Bird teaches the pick and roll. The pick and roll can give you many options to get open, or for your teammate setting the pick to get open. If your defender is guarding you closely, running them into a pick is a great way to get space between you. Often, it will create the space for you to shoot a jump shot, or there will be an opportunity to drive to the basket. Remember, the key to using a pick is to try to brush shoulders with the teammate setting the pick. If done correctly, it gives your defender two choices: to go under the pick, or over it. If they go under, that means they go around your teammate to try to meet you on the other side of the pick. This gives you space for a jump shot. If they go over, they follow you around the pick, which gives you an opportunity to drive. 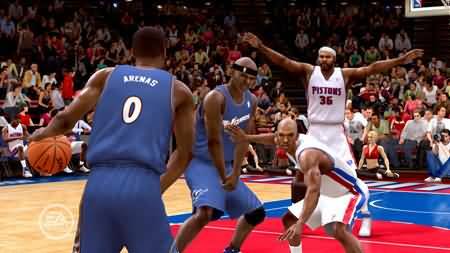 If your teammate's defender comes up to help, you can pass the ball to your teammate for an open shot. Another way to get open for a good shot is to move without the ball. Sometimes, the offensive player can catch the defense not paying attention and end up open for a jump shot or even a lay-up. Or, you can confuse the defense during a possession, or wear them out over the course of a game. But you're not going to do any of this if you're just standing around on offense. You need to cut to the basket and move without the ball. Cutting to the basket is simple - it's just running towards the basket, but being alert to where the ball is and being prepared to catch a pass. If you're moving without the ball, you should be cutting towards a certain spot on the floor where you can hit a shot. A lot of times, offensive players will set screens to make it easier for their teammates to lose their defenders when moving without the ball. 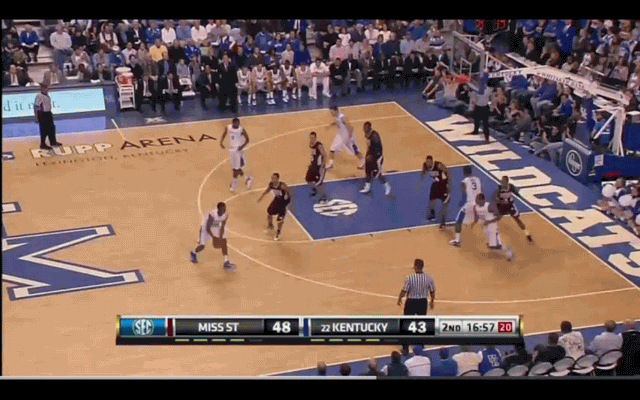 It works similar to a pick and roll, but the player is setting a screen for their teammate without the ball. When your teammate sets the screen, it's important to try to run around them at an angle that will make your defender run into the screen. It's a similar concept to running your defender into a pick. Doing this creates space between you and the defender, giving you the opportunity to drive to the basket or take the open shot. A player coming off of a screen near the baseline. We talked about how moving without the ball can help players score in all sorts of situations, even if they are less skilled or shorter than others. A great example of this in the NBA is Isiah Thomas. Don't get me wrong, he's one of the most skilled players in the NBA, but he's also one of the shortest. Despite that fact, he leads the NBA in scoring in the fourth quarter. How does he do this? He is a master at getting open from the pick and roll, and his whole team sets screens while he moves without the ball. Check out the video below on how the Boston Celtics get him open. This is one of the best examples I've seen of teams using the pick and roll, setting screens, moving without the ball, and getting open for good shots. If youth players do just a bit of what they see in this video, they will find themselves getting open shots more often than not. Coach Yancy has been coaching basketball for 36 years. Youth players he has coached have gone on to success in college, overseas professional teams, and even the NBA. His goal is to give parents the knowledge they need to help their kids improve at basketball. Join his email list to get training methods he has developed over his decades of coaching hoops.